Final photo from the batch of photos I took during my walk around York University last week. This is Heslington Hall that could be seen in the background of yesterday's photo. Heslington Hall is used as the administrationnbuilding for York University. Looking very 1960ish now with a forbidding concrete box-like facade the hardness of Derwent College is softened a little by the water and fountains. In the background is the softer featured Heslington Hall which acts as the administration building for the university. Wentworth College and the biology department make a tranquil reflection on this view from the ridge that runs between Goodricke and Vanburgh Colleges. The bridge is swathed in scaffolding with notices saying that the bridge is to be replaced at some point. Because York is fairly flat many people in York own a bicycle. It must be said though that there are not as many cycles on the road as there used to be. The lunchtime exodus of pedestrians and cyclists from the Rowntree factory in Haxby Road used to be a tourist attraction years ago with tourists taking up a startegic position near the dining block to watch as people came pouring out of the factory. Nowadays there is not this spectacle as automation has reduced the number of workers and car ownership has risen amongst those remaining. I was impressed with the number of cycles outside Goodricke College and felt it was worthy of a photograph. Goodricke College is named after John Goodricke a famous astronomer who lived in York at the Treasurer's House next to the Minster in the late 1700s. Wouldn't get these in the Baby Belling Ruby! In the comments the other day Ruby mentioned the difficulty of students getting a duck into the Baby Belling cooker. I am sure no student would get these two into a cooker even if they wanted to. This pair of black swans came hurtling over to me when they saw me by Derwent College and then followed me all the way round the lake past the Physics building and round by the bridge towards Vanbrugh College where they lost sight of me as I headed alongthe walkway away from the lakeside. They seem fairly amicable for black swans, previous encounterI had with a black swan was a hissy spitting affair with the swan on the lake just below Chartwell which was the home of Winston Churchill. I was glad that it was behind a steel link fence. York University with a lake created by damming the local beck provides a wonderful habitat for waterfowl and many types can be seen whilst strolling around the lake. The birds are accustomed to human contact and I must say that I have never been this close to a Coot before. I was amazed by the feet, I do not think that I have ever seen Coot feet before and I think they are amazing! Even today just as when it was built in the late 1960s this building looks like a futuristic flying saucer that has just landed on the lake at the university. Over the years the hall has been a popular music venue in the city and each year hosts the Church of England Synod meeting. Although many of the college buildings that were built at the same time now look dated and have a typical 60s poured concrete look about them I can remember many people enthusing about the brave new look of the campus. The lake that forms the centrepiece of the campus was formed by damming the local beck (for those that don't know, beck is Yorkshire speak for stream). Not many people seem to have heard that version nowadays as they only learn the London publishers book sanitised version that has become the standardised and pasturised acceptable version. What has this to do with York University, not a lot except for all the safety signs around the campus, Danger Thin Ice, Blue Green algae in lake avoid coming into contact with water and wildfowl. Whatever happened to students living dangerously! Another view of the Merchant Adventurers Hall viewed from the side of the River Foss next to Merchantgate. I'm a little late today doing my blog, my PC gave up the ghost so I have been forced into using my laptop and had to download a load of software for it as wellas having to attend to several other family matters. As you walk along Fishergate from the end of Piccadily the signage on this building makes it stand out from the rest of the buildings in the terrace. If memory serves me correctly Oxtoby's also had a garage at the end of Piccadily where Wetherspoons Postern Gate stands. This photo links two of the city's most popular attractions, York Minster and The National Railway Museum. The road train plies between the two venues. Lendal Tower next to Lendal Bridge has served many purposes since it was part of the city defences. For many years it was the offices of the York Waterworks Company but has recently been sold and planning permission granted for yet another eating place. A closer look at the angel gaurding Lendal Bridge reveals some of the other adornments on the bridge. To the right and left of the top of the shield are ornate renditions of VR or Victoria Regina. 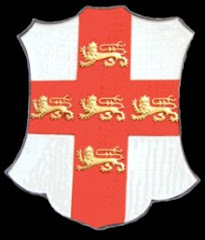 To the righta nd left above the angel's head are the ecclesiatical cross keys, three lions en passant and a Yorkshire white Rose. The cold weather we have had over the last few days is now going and the ice that had formed on the River Foss is now starting to melt. Here are some ducks and geese in and around the ice on the River Foss. As I was taking this photo the pedestrian walked into view and seems to reflect the same pose as the angel holding the cross of St. George under the light standard on the bridge. My eldest son was home over the holiday and can be seen here with his back to the camera looking towards Lendal Bridge and Lendal Tower. I think it is admirable the way these youngsters get out on a cold morning take most of their clothes off and then row up and down the river in boats so flimsy that one man can lift them out of the water whilst being shouted at not to scrape the bottom of the boat as it is already very thin. Just by Lendal Bridge the rowing club is situated next to the river ouse where you often see rowers pulling up and down the river. Although there may only appear to be three fishermen on the riverbank by Lendal Bridge I overheard the chap in the white T shirt talking about good places he had fished on the river. Was it a case of fishermens tales? Framed by the archway of the entrance into the Museum Gardens is the Jorvik Hotel in Marygate. Jorvic is one of the spellings of the Viking name of the city. This is a popular entrance to the gardens particularly for those makingtheir way from Marygate Car Park towards town using the gardens as a shortcut. The entrance is through an archway in what used to be the boundary walls of St Mary's Abbey.